Splish, splash, splish, splash, splish, splash… It was another successful Saturday for both the men’s and women’s crew teams as they raced on Lake Quinsigamond, Mass. against other northeastern schools. Due to the size of the Cards’ rowing teams, both the men’s and the women’s teams were able to field three boats with eight rowers each. In the men’s competition for the first varsity eight, the Cards placed in the runner-up position with a time of 6:05.41, only three seconds behind Worcester Polytechnic Institute (WPI). Following the Wes boat came Colby College, University of Massachusetts, and Hamilton, all a little over eight seconds behind. For the second varsity eight, the Cards again placed second to WPI with a time of 6:20.96, adrift by precisely five seconds. In a strikingly similar fashion as the first varsity eight race, UMass and then Colby came roughly eight seconds after the Wes boat. Finally, in the third varsity eight race, the Cards again came across the line in second to WPI in just 6:41.17, around 14 seconds off the pace. Two seconds behind them came the Mules. These results represent remarkable consistency, but may be ultimately overshadowed by the women’s boats. In all three varsity eight races, the women took the top step of the podium. In the first race, they won with a time of 6:54.8, a solid nine seconds ahead of Hamilton, who placed second, with WPI, Colby, and Smith College following. In the second race, the Cards finished in 7:05.59, as WPI followed closely behind, just 4 seconds adrift, leading Colby, then Hamilton, then Smith. 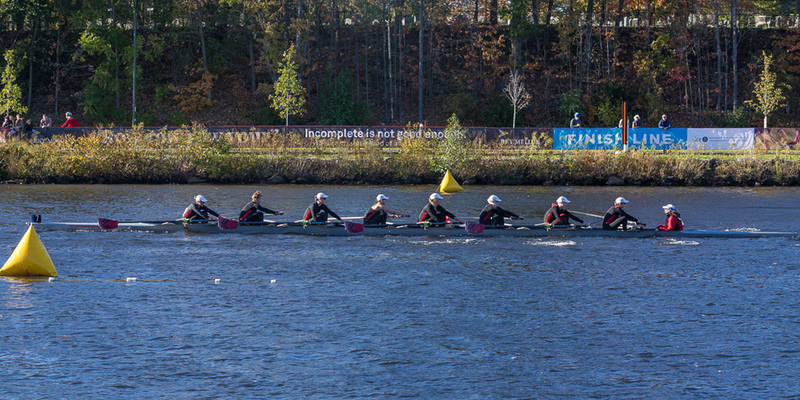 The final varsity eight for the women was won by a time of 7:34.62, eight seconds ahead of WPI, who was 16 seconds faster than Colby. The importance of this regatta lies in its location. Lake Quinsigamond also happens to be where the New England Rowing Championships (NERC) and the ECAC National Invitational Rowing Championships will be taking place (ECAC). These events are the final two tourneys of the rowing season, and given their importance, it’s no surprise that scoping out the course is a vital part of postseason preparation. Ultimately, both teams have been performing rather well, but from an outside perspective it is often a little unclear whether the teams can continue to improve. Despite the strong results from both teams, the race conditions still proved to be challenging. For the men, there was an 18-mph cross tail wind, and for the women, a 15-mph one. Although a tail wind sounds appetizing, cross winds can result in waves slapping the side of the boat. In the worst case scenario, this means that the boat can capsize. As a consequence, there is a lot of responsibility on the coxswain to steer the boat correctly to allow it to travel as efficiently as possible through the water and to prevent it from tipping over. “The cross wind can throw you off for a few strokes, particularly when it comes in strong bursts, but it’s good practice,” Bascombe also remarked. However, there is a positive spin to being forced to overcome these nasty crosswinds. When Michael Phelps was training as a junior swimmer, his coach deliberately broke his goggles right before a race, forcing him to swim the race blind. Although he may not have performed at his very best during that particular event, it became useful preparation for when his goggles began to fill with water during the 200-meter butterfly in Beijing. Likewise, encountering these crosswinds in regattas before the end of the season championships provides the Cards with experience that may be critical to their future success. This upcoming Saturday, April 15 will be the next opportunity for the Red and Black to test and improve their skills as both teams face Tufts, Bates, and Wellesley College in Medford, Mass., near the Tufts campus. The following Saturday, April 22, they will travel to Pittsfield, Mass. and take on Williams. This will be the last opportunity for the women before the New England Rowing Championships, but the men’s team will have one more race the very next day back on Lake Quinsigamond against Trinity. For some teams, the staying motivated during the back half of the season can be a tough challenge. But only true champions can maintain a high level of work ethic throughout the entire season to achieve their goal. With their first place ranking and recent results, Wesleyan’s rowing has a lot to live up to. But fans shouldn’t have too much to worry about.